Hemingway Editor Review  - Is It Worth It? 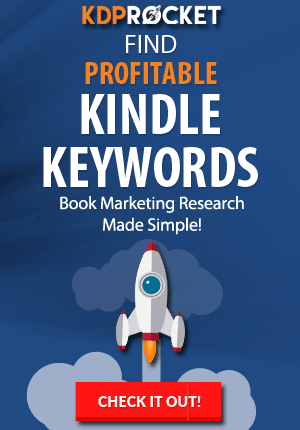 To stay on top of the latest in book marketing and writing, I love to check out the latest tools claiming to help authors. 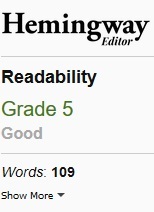 Following hot on the heels on my ProWritingAid review and Grammarly review is my full Hemingway editor review. I’ve often heard about my fellow authors using Hemingway to finetune their writing. So what exactly is it, and how can it help you? Unlike ProWritingAid, Hemingway isn’t an in-depth virtual writing tutor. Instead, it aims to tighten up your words and make them more concise and impactful. I decided to check it out and see how it stands compared to other writing tools. So, I put together this full Hemingway Editor review. Let’s get to it. As always, you will find that this article does have affiliate links. 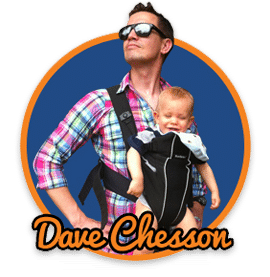 The existence of these does not sway my vote, but the extra income that comes from clicking and using one of my links helps replenish the coffee fund and keeps me writing. 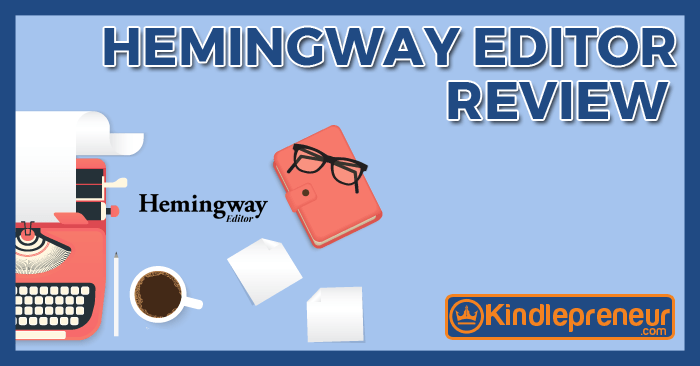 Hemingway Editor Review – What Is Hemingway? 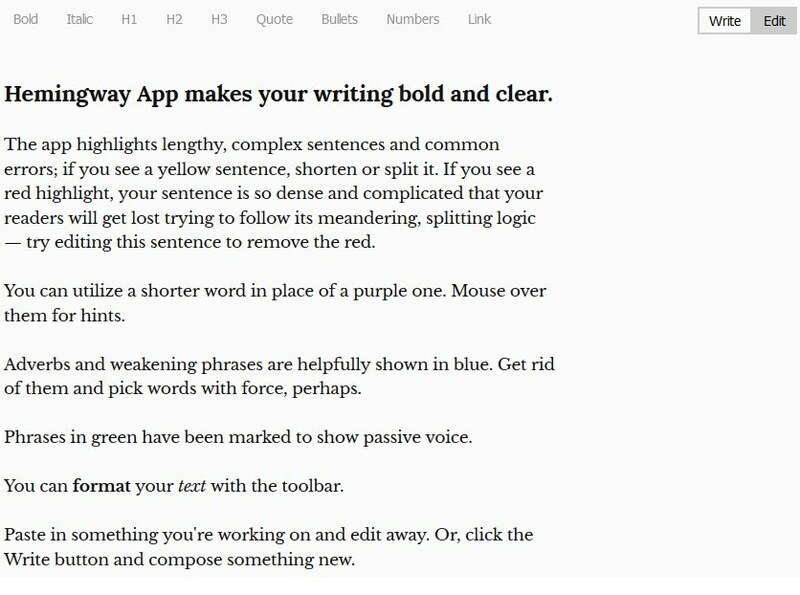 Hemingway, named after the master of literary brevity himself, aims to “make your writing bold and clear.” It isn’t an in-depth grammar checker or writing coach, like Grammarly or ProWritingAid. Instead, it is a minimalist but powerful tool to improve the style of your writing. How does Hemingway achieve this? When you either paste your writing into the Hemingway Editor environment or write directly within, it highlights your work using different colors. Each color corresponds to a different type of improvement Hemingway suggests. So what are the suggestions made by the Hemingway tool? Yellow Sentences: These sentences Hemingway identifies as lengthy or structurally complex. Hemingway suggests to split or simplify yellow highlighted sentences. Red Sentences: Hemingway feels these sentences meander and may confuse readers. Rework these sentences until the red highlight vanishes. Purple Words: The chosen color here is an in-joke for writers. Purple words have a more suitable, simpler alternative. Hover over them to see Hemingway’s suggestion. Blue Words: Blue words are adverbs or weak and hesitant language. Hemingway feels these should be omitted. Green Phrases. These indicate the use of passive voice. While this may be appropriate in some contexts, the active voice is typically preferred. If you’d like to jump right to “how to use the Hemingway Editor” click here to skip to that part of the article. The online version of Hemingway Editor is completely free. The creators have indicated they intend to keep it this way. The desktop version, Hemingway App, is available for a one-time payment of $19.99. The price is the same for both the Windows and Mac versions of Hemingway. Purchasing Hemingway software also entitles you to free upgrades whenever they are available. Now, let’s see how Hemingway compares to similar writing solutions, like Grammarly and ProWritingAid. In this instance, it’s not really a case of a clear winner. Hemingway is suited to some things while Grammarly and ProWritingAid are suited to others. However, overall, I think Hemingway is a great, affordable option for writers. It will tighten up the style of almost any writer out there. The free version is a great way to see if Hemingway is right for you, and the full version is excellent value at only $19.99 for lifetime access. Check It Out Check It Out! Check It Out! Note: The grammar is usually better on ProWritingAid, however, I think Grammarly has a better handle on commas and their placement. As you can see, ProWritingAid is more fully featured. 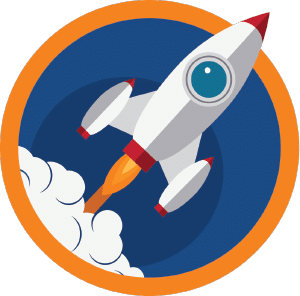 However, if you’re on a budget or don’t require the full functionality of ProWritingAid, Hemingway Editor is more than worthy of your attention. The online Hemingway Editor offers two modes: Write and Edit. While you may choose to compose short pieces in the Hemingway ‘write’ environment, I wouldn’t recommend it in general. There is no login or cloud backup for your work. Therefore, if your browser crashes or something else goes wrong, you will lose anything you’ve composed in the Hemingway online ‘write’ environment. By clicking on the ‘Edit’ option, you access the full range of Hemingway analysis. Formatting options at the top of the screen. 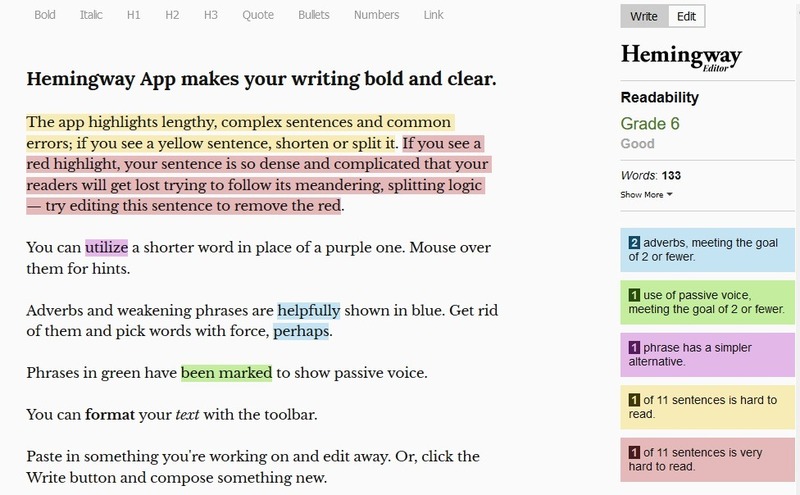 Colored highlights of your text in the center of the screen, indicating the type of improvements Hemingway thinks you should make. A summary of Hemingway’s findings on the right hand of the screen. Let’s take a closer look at each of the three sections. This is useful for bloggers. You can tidy up your writing style in Hemingway and then use the above formatting options to get your text totally ready for publication. Let’s take a look at the colored highlights in action. A sentence highlighted in yellow indicates it is hard to read. Hemingway suggests shortening or splitting it. A sentence highlighted in red indicates it is very hard to read. These are like yellow sentences, only more severe. Words highlighted in purple indicate a complex word for which a simpler alternative exists. When you hover your mouse over a purple word, Hemingway suggests simpler alternatives, as seen below. When a word is highlighted in blue, Hemingway feels it is weak. By hovering over a blue word with your mouse, you see Hemingway’s suggestion as to how to improve it. Above, Hemingway suggests an improvement for an adverb. Above, Hemingway suggests a way to strengthen the use of a qualifier. Green highlights indicate the use of the passive voice. Hemingway provides a summary of your data on the right of the screen. This offers the following information. Hemingway analyzes your text to assess the grade level it is written at. According to the creators of the Editor, the average American reads at a tenth-grade level. Ensuring your writing is at or below this grade level will make it accessible to the average American. 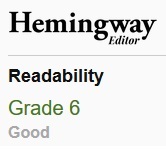 Ernest Hemingway’s words are assessed as being at the fifth-grade level. This is proof that clear language does not diminish the power or quality of writing. Hemingway displays a word count for your text. By clicking on ‘Show More’, the following information is displayed. I particularly like the ‘reading time’ feature here. Many popular blogs and print magazines offer this information, so having Hemingway calculate it for you is a useful feature. 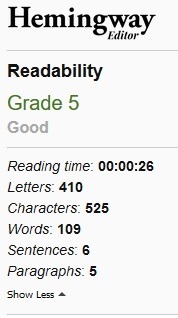 Hemingway not only displays the number of adverbs featured in your text but calculates whether it is an acceptable number based on the length of your writing. Hemingway shows how often you use the passive voice and calculates how often it should be used based on the length of your writing. For more information on using passive voice click here. Shows the number of simpler alternatives Hemingway suggests for the text you have written. The number of yellow sentences identified by Hemingway. The number of red sentences identified by Hemingway. The above data combine to offer a lean and useful summary of your text. It’s like having a writing tutor. It offers in-depth insight into your strengths and weaknesses that no other software does. It can be tailored to your particular style of writing. It is superb value for lifetime access when using the exclusive Kindlepreneur coupon (code KINDLE40). If you need a limited level of functionality and are on a budget, then definitely check out Hemingway. However, if you want the best of the bunch, ProWritingAid is the way to go. You now have an understanding of what Hemingway Editor is, how it can help you, and how it stacks up to your rivals out there. Have you used Hemingway? Do you prefer it to the other options out there? Hit me up in the comments and let me know your thoughts!